The Libertines frontman will be performing five dates on his Eudaimonia tour, starting at Bristol’s O2 Academy on May 11 and taking in Glasgow, Manchester and London’s Hackney Empire. Pete is currently finishing his second solo album after the success of his 2009 debut Grace/Wastelands. 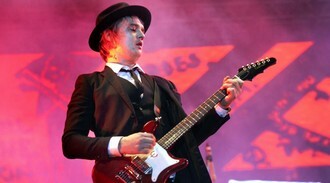 He has notably chosen a different London venue from The Libertines’ gig in September last year at Camden’s Electric Ballroom, when Pete suffered “a serious anxiety attack” before a performance and fled to a hotel near Coventry. The band were forced to cancel their show in London and another date in Manchester. A message on Pete’s website The Albion Rooms read: “Peter suffered a serious anxiety attack during the hours leading up to the scheduled performance at the Electric Ballroom last Thursday. Pete entered a rehabilitation centre in Thailand at the end of 2014 for drug addiction and The Libertines revealed they had taken drug counsellor Dylan Kerr on tour with them as they promoted Anthems For Doomed Youth. Tickets go on sale for Doherty’s tour at 9am on March 11.